The improved Tri-Core Cervical Pillow features a new fiberfill that adds significant life to the product. 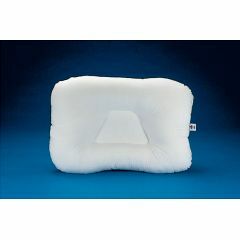 This high-resiliency fiber is springier than the previous fiber, and is guaranteed to maintain proper neck support throughout the entire life of the pillow, not to mention provide better comfort. The unique trapezoid center gently cradles your head and supports the neck in its natural position to help alleviate the pain that accompanies numerous maladies. Premium Fortrel Bactishield fiber combats growth of bacteria while providing lasting freshness. The new Tri-Core also has an improved cover. Made from a higher-thread count cotton fabric, the new cover feels soft and cool on the skin. Three size options provide comfort for children and young teens, as well as smaller- and average-size adults. Is especially suitable for those in the Correct and Maintain stages of care. The Tri-Core is the #1 fiber support pillow recommended by the medical professionals who most commonly treat neck and head pain. In addition to alleviating pain caused by many conditions, airway blockage – a major cause of snoring – may also be helped. Most people experience an increase in sleeping comfort within a couple of days of using this pillow. Others may require up to two weeks before the neck and back muscles adjust to their proper position. The Tri-Core fits a standard-sized pillowcase; features a white 100% cotton cover. Is there anymore information about the difference between Standard and Gentle? The one I have now is Standard.